Yesterday, Apple announced a new programming language called Swift for building iOS apps. 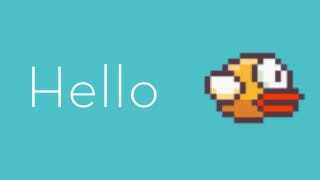 Less than 24 hours later, someone has already used it to build a Flappy Bird clone. If you aren't familiar with Hello World, it's basically what programmers traditionally use to demonstrate a programming language or test a basic system, since it's a very simple thing to do. Testing a printer? Make it print the words Hello World. Well, when you're learning a new way to make games, you could use an equally simple project to get a feel for a new platform. We've already seen it done as a demonstration of how 'easy' it is to make games in Unreal Engine 4. Now, Nate Murray jumped on the news of Apple's new language and built Flappy Bird in Swift. Maybe next time someone announces a new programming language, they'll just start with Flappy Bird in the actual presentation?